A girl discovers that shapes are everywhere in this companion to Round Is a Mooncake. Spanish vocabulary words are sprinkled throughout rhyming, reader-directed verse: “Stone metates inside our casa/ help us grind our corn to masa./ Rectangles are flags that fly/ above the scoreboard, way up high./ How many rectangles do you spy?” Parra’s thick paintings have a rough, weathered wood-grain texture, and his figures—with their serene facial expressions and rosy cheeks—resemble Mexican folk-art dolls. Whimsical elements like a mermaid in the bay and celestial ornaments dangling from an avocado tree add pizzazz to this poetic ode to shapes. Ages 4–8. Author’s agent: Natalie Lakosil, Bradford Literary Agency. PreS-K-This simple rhyming title about shapes and Mexican culture is a great introduction for new Spanish speakers. 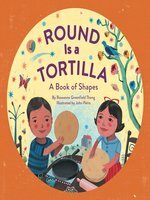 This concept book provides listeners with names for and information about shapes, illustrated by objects in Latino communities: "Round are tortillas and tacos too. Round is a pot of Abuela's stew." At some parts the narrator asks questions, but there is not enough of a pause to let young listeners chirp in. Maria Cabeza's voice is very soft and calming with excellent pronunciation of Spanish words. The CD comes with two tracks, one without page-turn signals and one with signals. Since the audio is based on a picture book, using the two together will be more effective than the audio alone. This is an additional purchase for communities serving a Hispanic population or ones looking for more multicultural audiobooks.-"Katie Llera, Bound Brook High School, NJ"